It is amazing how side-tracked you can get when everyone in the household is sick. First it was CTO, then both Miss G and I copped it. And then we went on holiday, which we came back a few days ago. We went to Japan, it was awesome! So, I do apologise for my absence. This recipe I actually came up with a month ago whilst I was still feeling a bit crook, but I wanted to eat something bit hearty to combat the cold germies. Now, if you’re a follower of my Instagram page (*cough* shameless plug *cough, cough*), you would’ve seen me post a few pics of bowl food in the past. 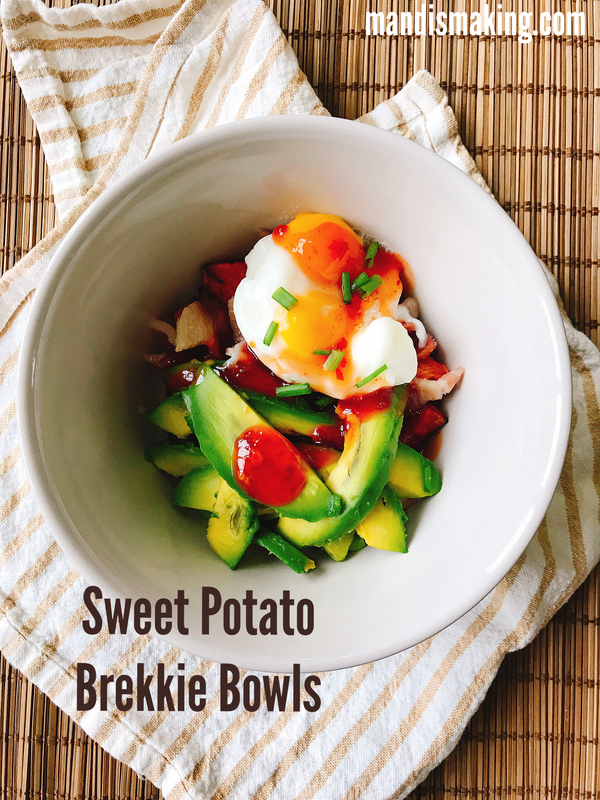 I love making up a quick bowl of something, be it savoury or sweet, and I really like making sweet potato bowls. Quick note: I made nearly this entire dish in my airfryer. No, not another plug, I’m just saying that the recipe may look a bit funny if you’ve never cooked with an airfryer before. You can make this on the stove or in the oven though, it’s up to you. Now, let’s look at this bowl. I made this as a brunch-y type of food, mainly because I’m not a big brekkie eater and I tend to eat late… say about 10am? And I’d rather have a big brunch then eat brekkie and lunch. But this can be a breakfast, a lunch, or a dinner, it’s a whenever bowl. The base of the bowl is, of course, sweet potato. It’s been peeled, chopped, and then tossed in a bit of olive oil before going into the airfryer for a quick cook. It’s topped with streaky bacon (also airfried), some avocado, and a cooked egg – poached or fried, pick your favourite way. I also added a good slug of sweet chilli sauce and a sprinkle of spring onion tops, but again, you can top it off however you like. This is marked as a 2 serve recipe, but they are small-medium serves. Just a warning, this is a hearty meal, but not a big one. I had 1 serve for lunch when I made it, and the other serve the next day for brekkie. Let me tell you, they taste good cold, like a potato salad. But it’s fabbo warm, the bacon is smoky, the creamy avo just smooshes into the sweet potato ever so nicely, and the egg gives it some body. 300g golden/orange sweet potato, peeled and chopped into 2cm pieces. Preheat your airfryer with the basket attachment on 200C for 3 minutes. In a medium mixing bowl, coat the sweet potato pieces with the olive oil. Using a slotted spoon or a pair of tongs, transfer the potato to the airfryer basket once it is preheated. Cook for 5 minutes, shake the basket, cook for another 5 minutes, shake it again, then a further five minutes. Divide the potato evenly between 2 bowls. 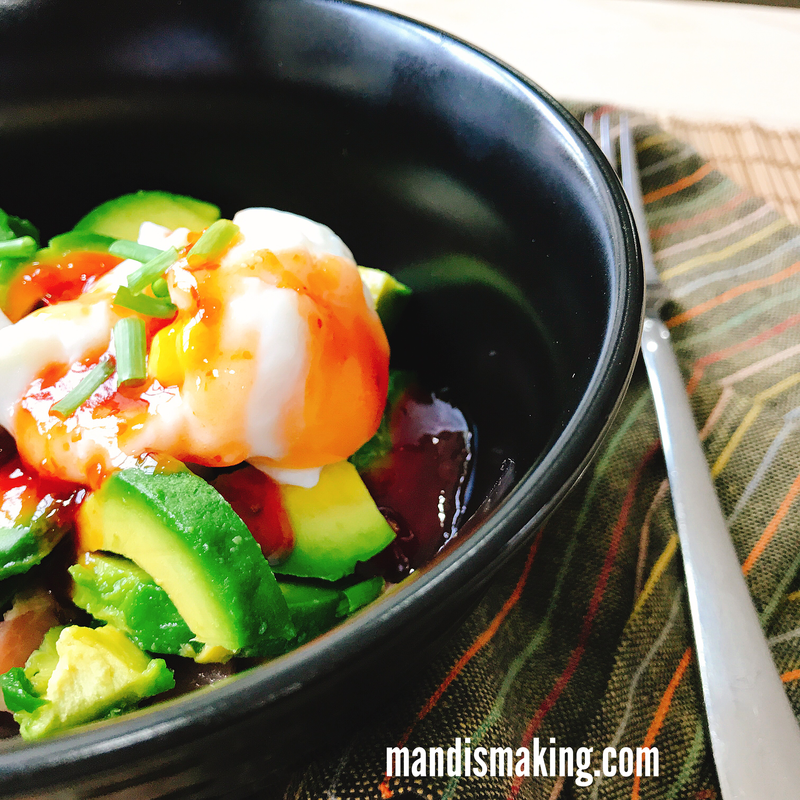 Top each bowl with half a sliced avocado, 1 egg cooked to your preference, and sauce or dressing. Notes: I use a microwave egg poacher to cook my eggs, but you can pan-fry them if you like sunny-side up or completely fried eggs. You can also cook them in the airfryer in a small tin. All cooking times are estimates, each airfryer can be different. I use a Philips Viva 0.8kg. Everything can be cooked on the stove or in the oven, just adjust the cooking times to suit your appliance.